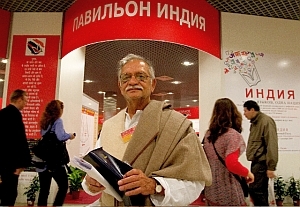 2009 has been declared the year of India in Russia, so it is logical that this country, with its thousand-year literary tradition, should be the guest of honour at the Moscow book fair - the biggest in Russia and one of the biggest in the world. The guest country's delegation was very representative: more than 60 Indian cultural figures - publishers, writers, poets, translators, playwrights and critics. An exhibition of contemporary Indian books was installed in the central hall of pavilion 75 at the All-Russian Exhibition Centre, a site of almost 1,000 square metres. Every visitor was plunged into the magical world of India. The official opening of the fair featured speeches by First Deputy Prime Minister Sergei Ivanov and Press Minister Mikhail Seslavinsky, and there was also a word of welcome from the leader of the Indian delegation, Mr Bipan Chandra, chairman of the National Book Trust of India. He recalled the time when India and Russia, at that time part of the USSR, enjoyed strong political, economic and cultural ties. "There was a single cultural space from the Ganges to the Volga," he said, "but a lot of water has flowed under the bridge since then." He confirmed the enormous interest in Russian literature that still exists in India today. In his address, Ivanov cited an interesting statistic: the total published number of books by Rabindranath Tagore is exactly the same as the global total for Dostoyevsky, one of the most widely-read classics in the world. The Indian pavilion featured a display of books by Mahatma Gandhi and literature about him. The number and variety of these books could not fail to impress. In the centre of the hall there were books by Russian writers published in India and Russian books about India. Unfortunately, we don't know very much about each other in terms of contemporary literature, and today's Hindus' impression of Russia seems to consist of the books of Tolstoy, Dostoyevsky and, at a stretch, Gorky. There was also quite a number of books about India in the Russian language on display. Books of essays by Russian writers who travelled in India at one time or another are generally very popular. Maria Arbatova, Ravil Bukharayev, Marina Moskvina and others have put out books about their impressions of this amazing country, in some intangible way similar to Russia. This tradition goes back to the days of 15th-century Russian merchant Afanasy Nikitin and his journey beyond three seas. In addition to this display of achievements of Indian literature, there was an extensive programme devoted to the two countries' cultural co-operation. On September 4, India Day at the book fair, artists and musicians put on a day-long Indian celebration concert. Round tables on "Indian literature: a contemporary view" and "Inter-cultural co-operation through translation", as well as dialogues between Indian and Russian writers, also took place. India's literary academy (Sahitya Akademni) and the Russian publishing house Vostochnaya Literatura presented their projects - editions of the Anthology of contemporary Indian stories and the ancient treatise on the theatre, Natyashastra. During the weekend (September 5-6), there were masterclasses for children with the well known Indian children's illustrator Subir Roy. Finally, the "Book of the year" prize was presented at a Moscow theatre. There was a new special category - "The hundred-petalled lotus" - for a Russian-language book opening up India's culture for Russian readers. The award went to the Indian Philosophy encyclopedia published by Vostochnaya Literatura. The situation with translations of Indian authors in Russia is fairly positive. The book fair had a display of Indian classics, for example a fine edition of Somadeva, an ocean of tales in the Library of World Literature series published by Eksmo. But the Russian reader also has opportunities to discover contemporary writers in India or born in the country. The Amfora publishing house, for example, has published the novel Shalimar the Clown by the world-famous Indian Salman Rushdie, and Limbus in Saint Petersburg has published Hari Kunzru's novel Faceless.